The vineyards of Saint-Émilion sit on the right bank of the Dordogne River about 20 miles due east of the lower Haut-Médoc. The commune of Saint-Émilion is the prettiest of Bordeaux's wine towns, sitting atop steep limestone slopes and lined with narrow, cobblestone streets. Saint-Émilion is one of Bordeaux's largest producing appellations. It outputs more more wine than the combined Haut-Médoc appellations of Listrac, Moulis, Saint Estèphe, Pauillac, Saint Julien, and Margaux. This huge appellation has over 5,000 hectares with around 850 wine growers. More than 67% of its total area is vineyards. Saint-Émilion has been producing wine for longer than the Médoc. Its lack of accessibility to Bordeaux's port and market, however, hindered exports to mainland Europe and the region never enjoyed the commercial success of the left bank. As customers around the world are looking to drink their wines at a younger age than generations past, the popularity of Saint-Émilion has soared since the late 1990s. 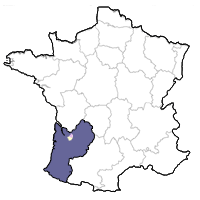 The appellation is also surrounded by four satellite appellations, Montagne, Lussac, Puisseguin, and Saint Georges, which enjoy a similar grape blend but not the complexity of the best wines. In the past fifteen years there has been an explosion of experimentation and evolution in the region, leading to the rise of a garagiste movement comprised of wines made in very small quantities from small parcels of land. Capturing the attention of the international wine press, many new producers have been suddenly thrust into the spotlight, often overshadowing the established regime of Bordeaux. This area has some of the most diverse soils of any wine region in Bordeaux. Many of the best vineyards are located on the plateau where the soils are rich in limestone, and on the slopes around the plateau, comprised of limestone and clay. At the very western end of the appellation, near Pomerol, gravel soils predominate. In addition, across the plain to the west of Saint-Émilion itself, sand lies over the limestone subsoils. Merlot is the king of grapes in Saint-Émilion, followed by Cabernet Franc and Cabernet Sauvignon in importance. Merlot, a fleshier grape than the Cabernets and more rapidly maturing, usually gives wines that are more supple in their youth than those of the left bank. Saint-Émilion was not included in the 1855 Bordeaux classification. Yet unlike the 1855 classification, it is regularly revised. In 1955 the wines of Saint-Émilion were classified for the first time. The list was updated in 1969, 1986, 1996 and most recently in 2006. This recent 2006 classification, however, was declared invalid following a series of legal actions, and the 1996 version of the classification has been reinstated for the vintages from 2006 to 2009. The appellation regulations also allow for a grand cru designation based on details of the harvest, including a maximum of 40 hl/ha rather than 45 hl/ha for basic Saint-Émilion, and a minimum alcoholic strength of 11%. Therefore the distinctions between Saint-Émilion and Saint-Émilion Grand Cru are not as large as one might expect, but something like the difference between basic Bordeaux and Bordeaux Supérieur. 40% of the wines from this region, in fact, qualify for Saint-Émilion Grand Cru certification.